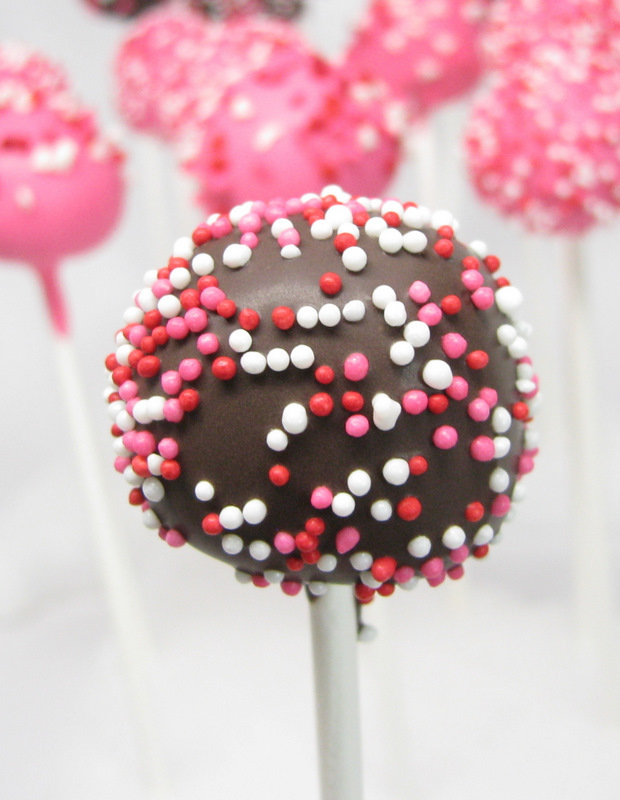 I’m sure by now everyone has seen Bakerella’s cake pops. If you haven’t, you really must head over there to see her cute stuff. 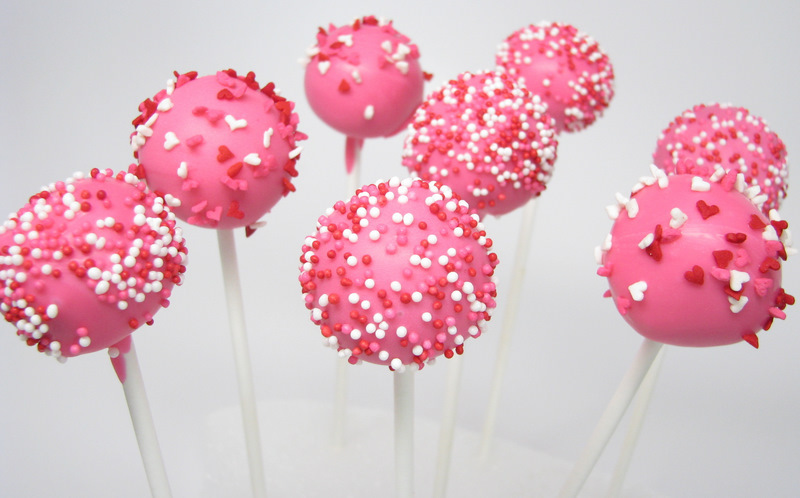 She even made cheesecake pops, which I am totally going to try. 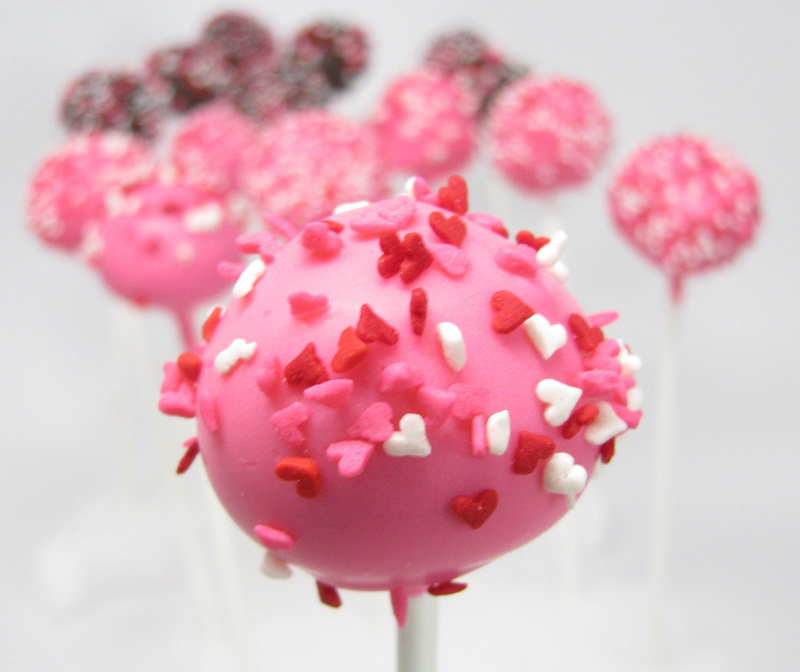 But anyway, I was going to make some cake pops as my final Valentine idea post, but my cake pop “dough” totally flopped. Did I add too much frosting? Was my cake too moist to begin with? I have no idea, but it was not working. 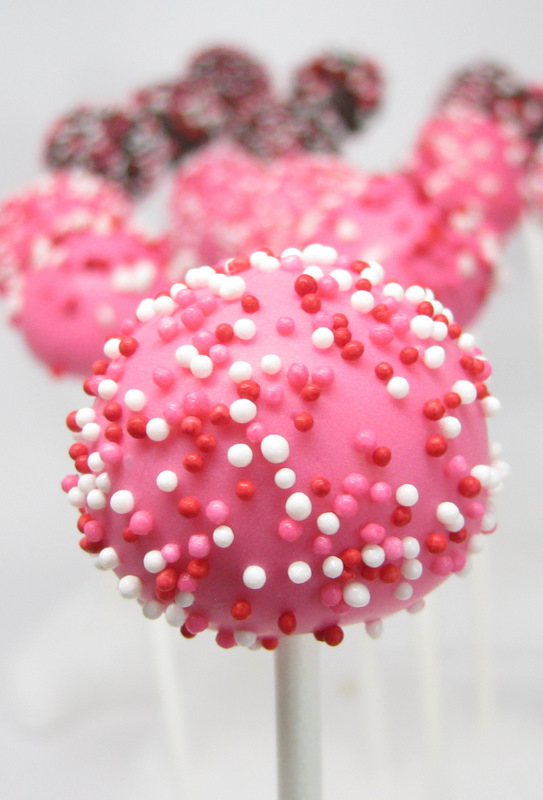 I was bummed because I think cake pops are super cute. I was just about to bake up another cake and try again when I happened to link over to this post, which is on the Happy When Not Hungry blog, written by Kara, who commented on my Fortune Cookie post, which is how I found it. Are you following me so far? 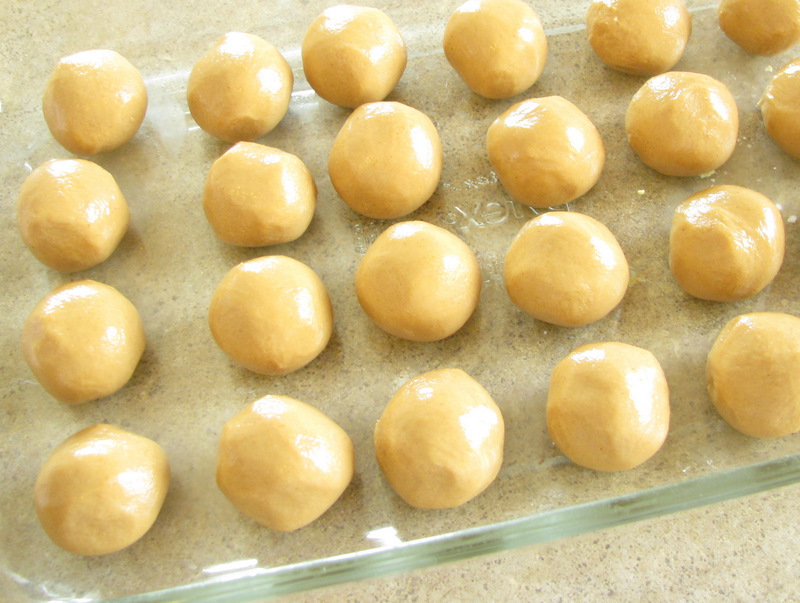 So her Peanut Butter and Nutella Rice Krispy bites (which sound amazing, by the way) reminded me of my Christmas peanut butter balls recipe, and I got to wondering if they would work on sticks. So I tried it. It’s funny, I’ve made all kinds of treats for this blog– cupcakes, fortune cookies, decorated cookies, rice krispy treats, etc., and nothing excited my kids like these did. They walked in the door from school yesterday and said “Woa!! COOL! Can we have one? You know– after you take your pictures.” (They are well-trained) These are definitely kid-pleasers. 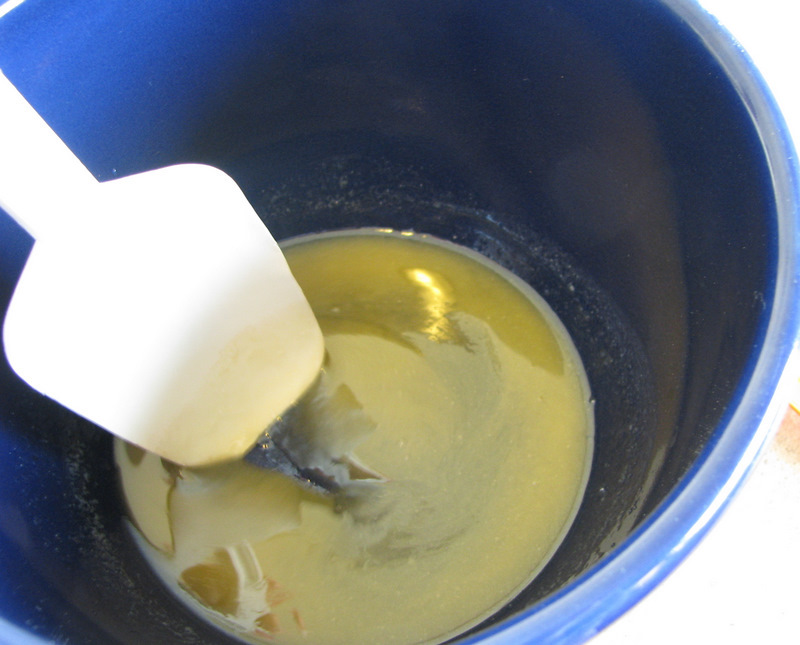 Mix together the corn syrup, melted butter, vanilla and salt in a medium-large bowl. 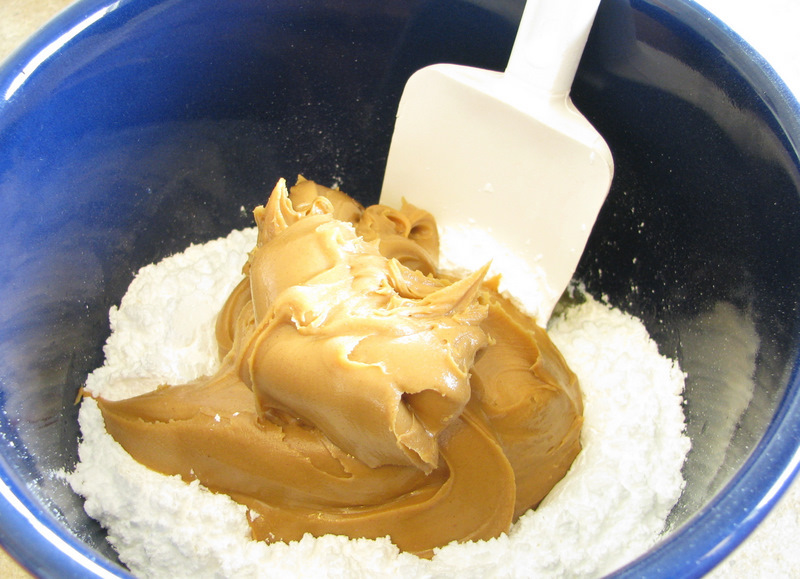 And then it will form a dough, almost like peanut butter cookie dough. And then cut those in half. Kind of weird, but it makes the right size. 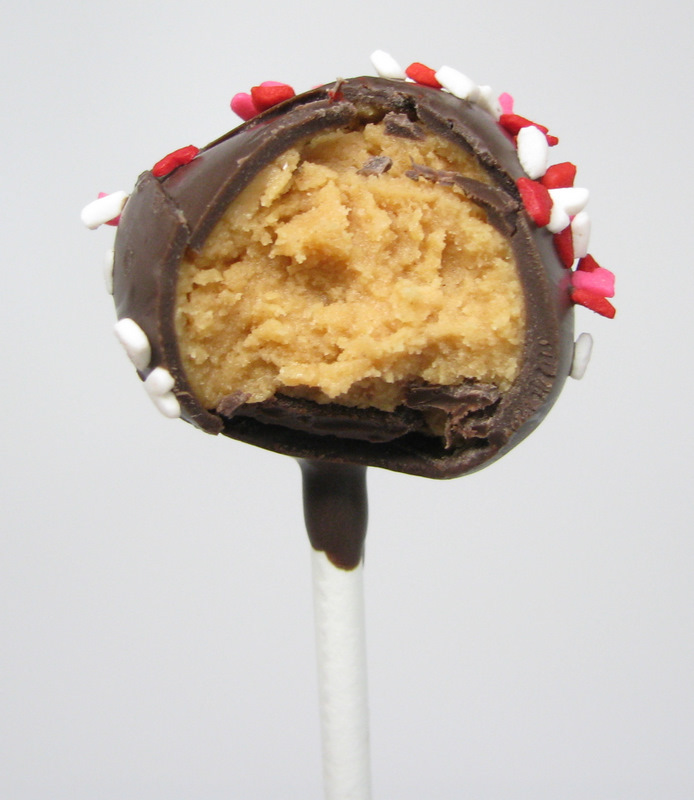 You really don’t want huge balls of this, or the ratio of peanut butter to chocolate will be off. The smaller ones will be more like Reeses Peanut Butter cups. If you have a smaller cookie scoop than I do, you might be able to just use that. 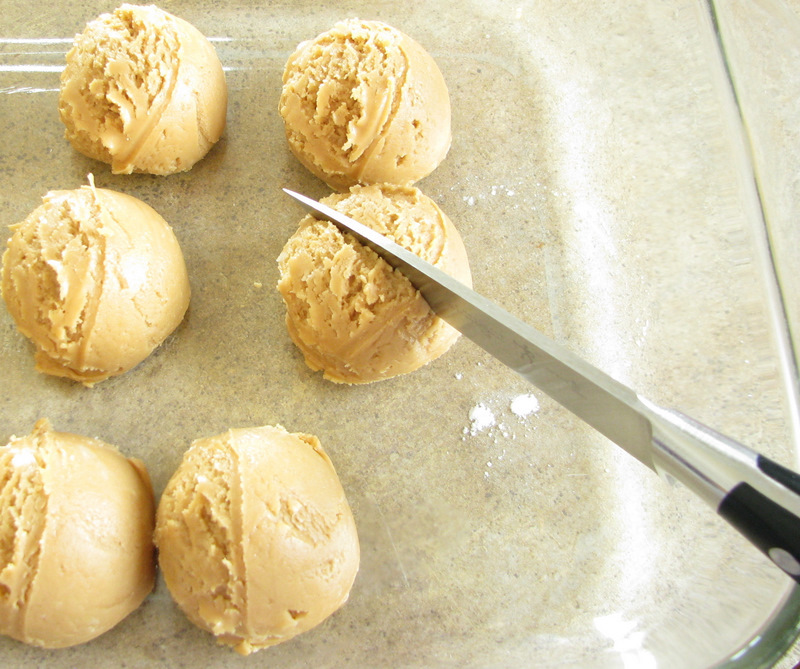 So after you cut the scoops in half, roll them into balls. and put them in a pan so that you can put them in the freezer. Freeze them for about 20 minutes. You don’t want them frozen solid, or they’ll crack when you put the stick in, but you want them pretty firm. While they’re in the freezer, melt some “chocolate”. 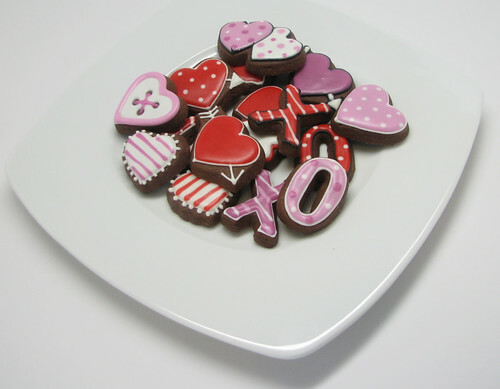 I put chocolate in quotes because this isn’t real chocolate. You can certainly use real chocolate if you want, but I’m a terrible chocolate temperer (is that a word?) My friend Tara is a real-life chocolatier, and she wouldn’t be caught dead using this stuff. But for me and my kids… yeah, I’m all over it. I actually really love using Merkens wafers. They’re pretty good for fake chocolate, and it’s so easy to work with. So melt some fake chocolate. Valentine colors are fun, so I picked pink to start with. 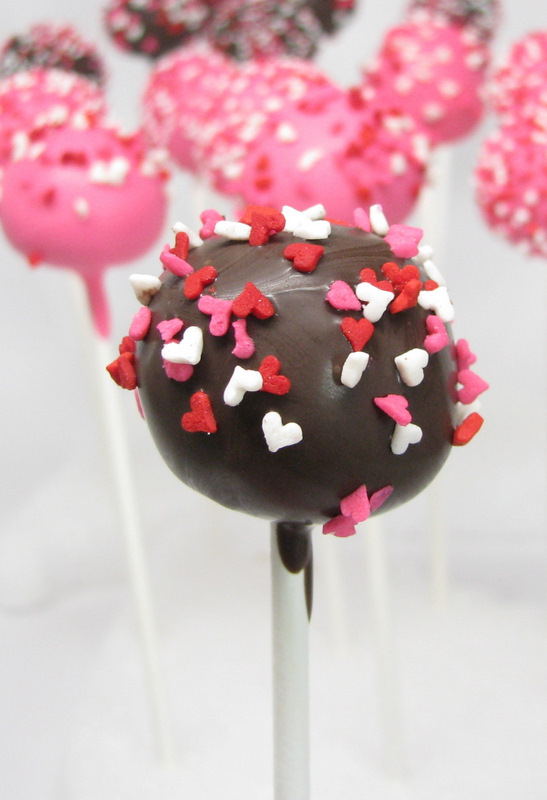 Dip a lollipop stick in the chocolate just so the bottom 1/4″ or so is covered. 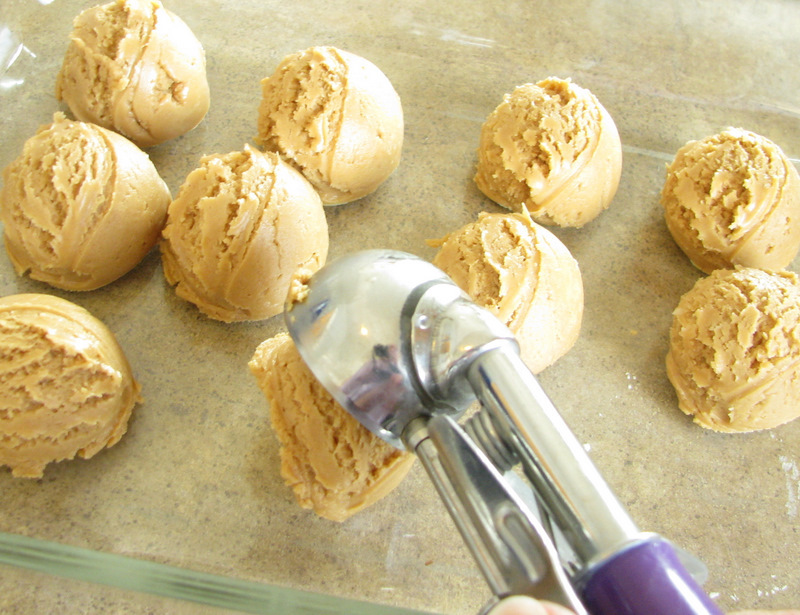 Then take one of your firmed-up peanut butter balls and insert the stick. And by the way, I used 6″ sticks for these, but 4″ sticks would also work. Next, dip them into the chocolate. You’ll want to go straight down, and use a spoon to help cover them. 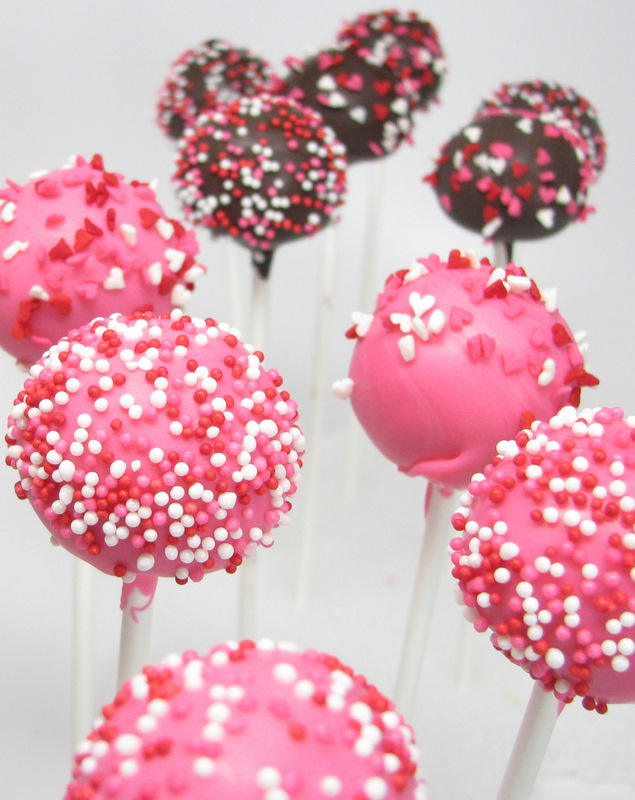 If you’re swirling them around too much, they could come loose and fall off the stick. If you want a really great video on this, check out the Amazon page for Bakerella’s book, and it’s the exact same process. She does a good job showing you how to do it. I’m sure that video is on her web site somewhere, too, but I couldn’t find it. You’ll want to lightly tap off the excess. Which pretty much shows you nothing. And of course I had to use the mini hearts because I love them. They’re super cute without sticks, too. I loved the crunch that the sprinkles gave them. Ok, that’s it for Valentine’s ideas. From here on out, you’re on your own. 😀 Have a great weekend and a Happy Valentine’s Day!! 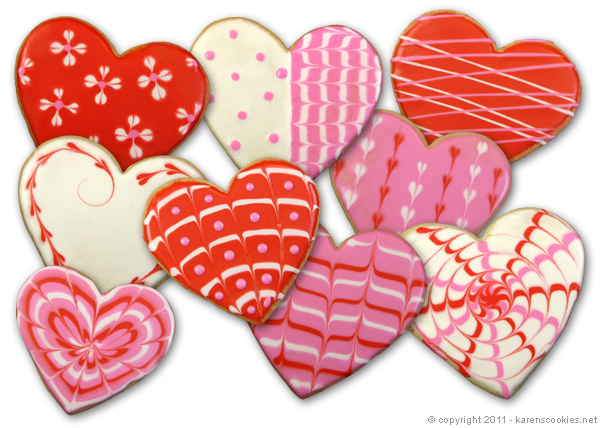 I’ll be back next week with some cookies that I can’t wait to show you! My kids told me what to make (they even gave me sketches to go by) and I recreated their ideas in cookie form. I’d better finish ’em up before they get home from school. They’re going to love them, and I hope you do, too! Ok, remember when I said at the beginning of the week that I was going to post a bunch of simple, easy ideas for Valentine’s day. Wellll…. this sort of does and sort of doesn’t fit into that category. I guess this is an easy idea for someone who is up for a little bit more of a challenge. (Does that even make sense??) It actually is very easy and very simple, but it takes a little patience to get the hang of it. The ingredients don’t get any more simple, and I’m pretty sure that the vast majority of you have them in your kitchen right now. So you should try it! Before you start making your batter, you’re going to need a template. Actually, this isn’t 100% necessary, but it’s very helpful. 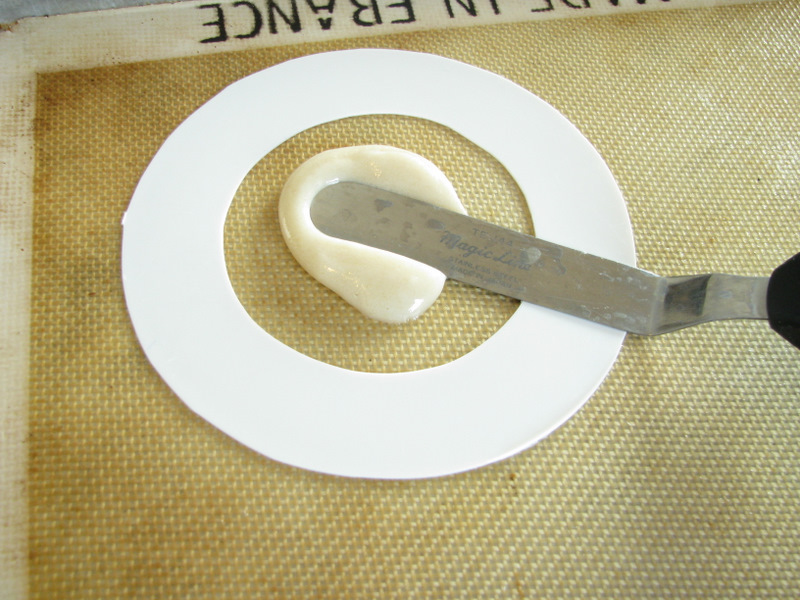 If you don’t want to take the time to make a template, you can skip this part and just spread your dough out free-form. To make the template, get a large disposable lid, or other piece of thin plastic. A cool whip, yogurt, margarine or sour cream lid are all good, as long as it’s at LEAST a 4″ diameter, not including the rim. 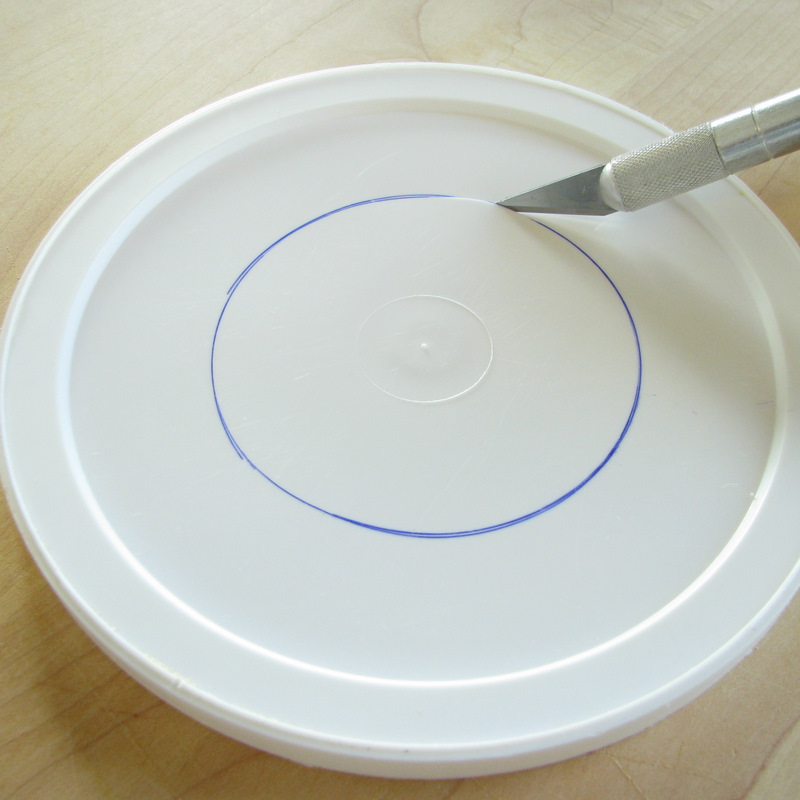 Find a 3″ circle to trace around. 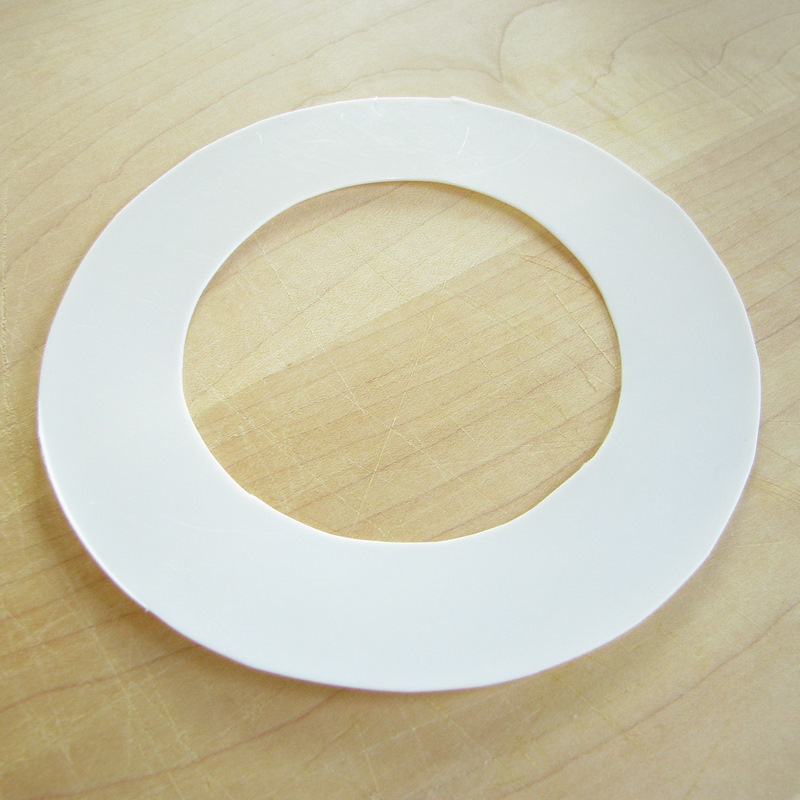 This is the 3 1/16″ circle from the plastic circle set. It is very well-used and loved, so the measurement has been worn off! 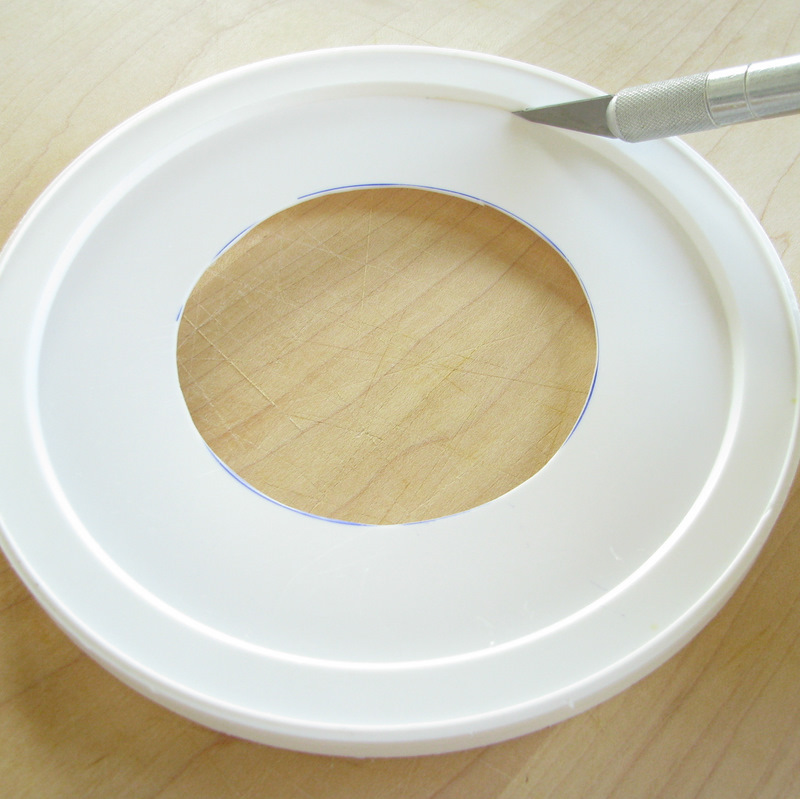 After you trace it, use an x-acto knife to cut out the circle. Then cut off the rim of the lid so that it lays (lies?) completely flat. You can use scissors or an x-acto knife. After that you’ll have a nice, reusable template. 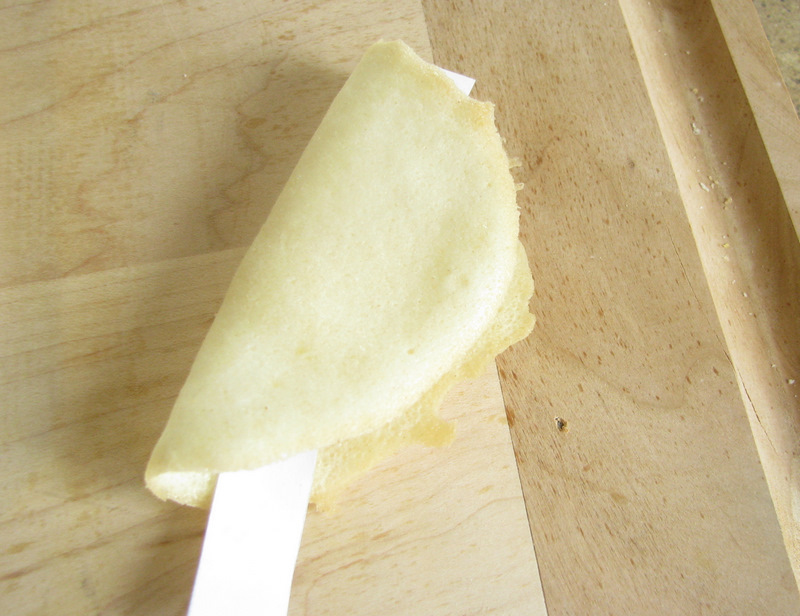 Wash it to get rid of all pen/pencil marks because those will definitely get on your fortune cookie dough if you don’t. Don’t ask me how I know that. 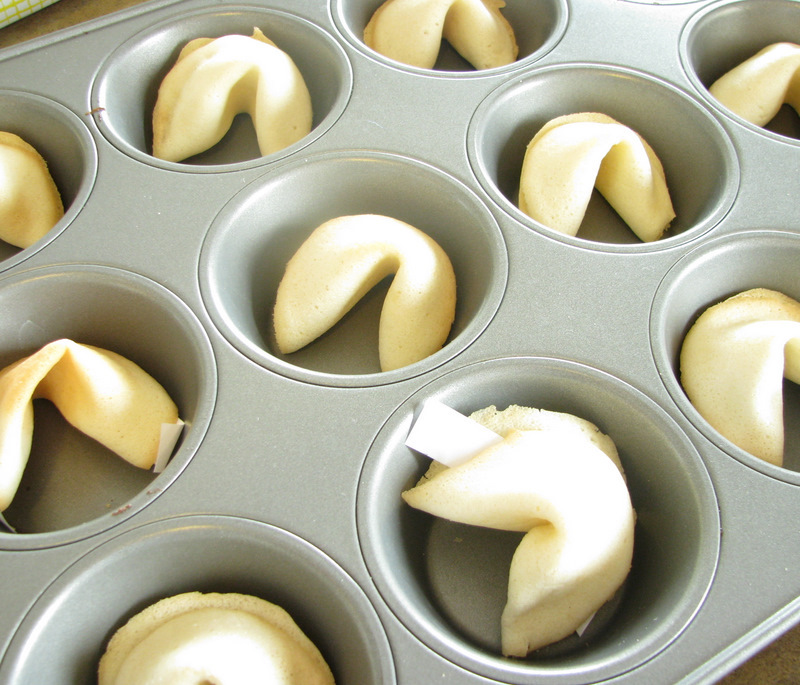 One more thing you need to do before you make the batter is to write your fortunes and have them ready. 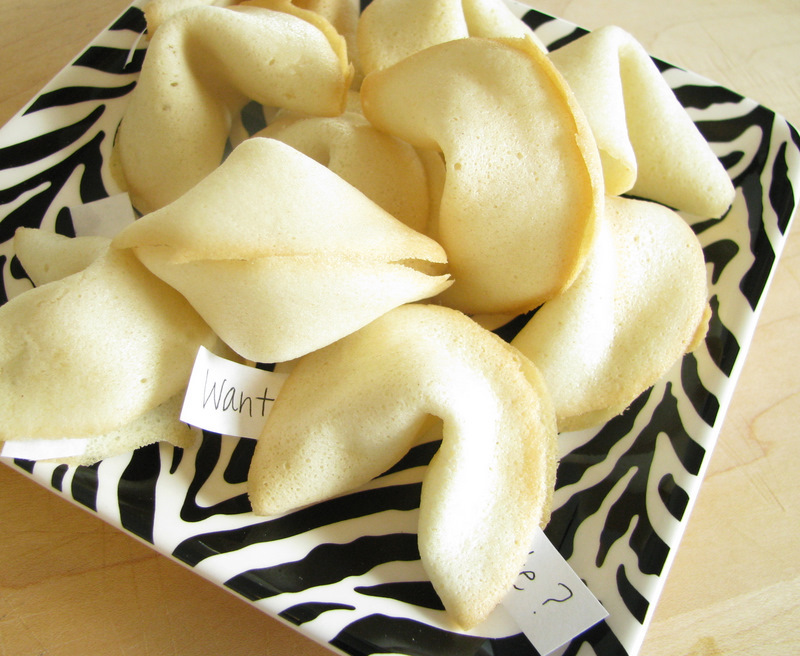 Cut strips of paper 1/2″ by 4″ if you want the fortunes to come out the edges of the cookie, or 1/2″ by 3″ if you want them all hidden inside. I did mine 4″, but I think I’d do 3″ next time. I think this is where you could let your creativity fly. I was not very creative with these. At all. But you could print them on fancy paper, and you could do fortunes that would match the personality of the recipient. 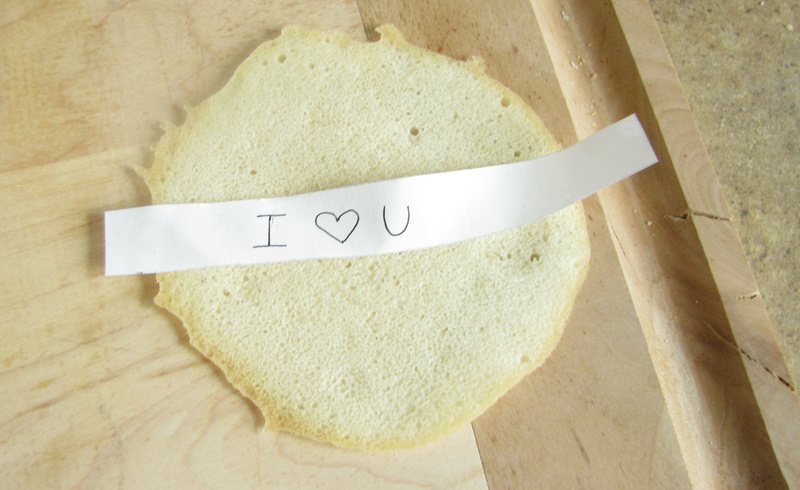 I think writing cute things for your kids and slipping them into their lunch for school would be really fun. Be creative. Oh, and one more thing before you make the batter– Preheat your oven to 400 degrees. Put the egg white and vanilla in a bowl. Whisk until it gets foamy. Add the sugar and salt and whisk until smooth. 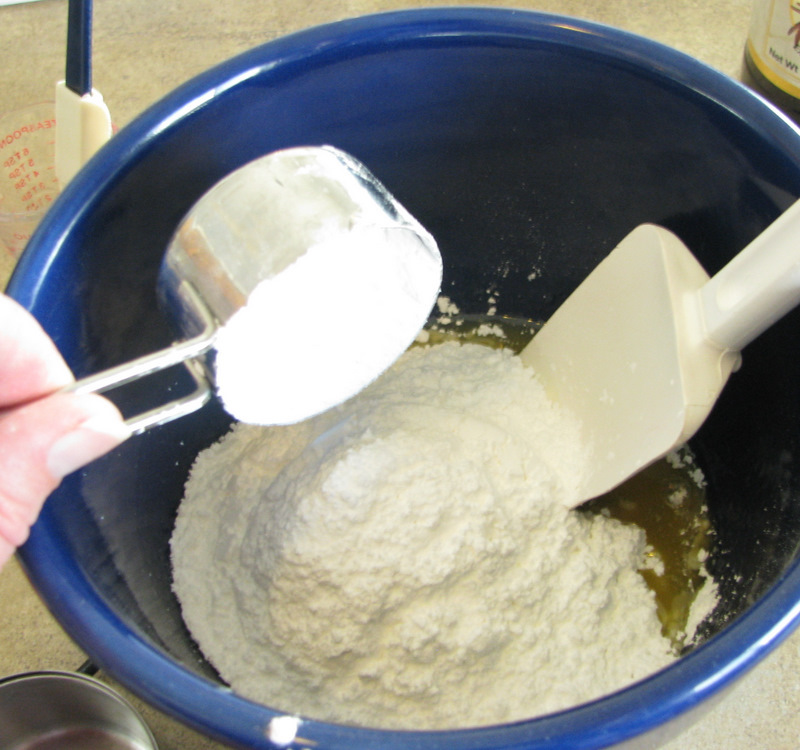 Stir in the flour until a smooth batter forms. It’s actually kind of a batter/dough hybrid. 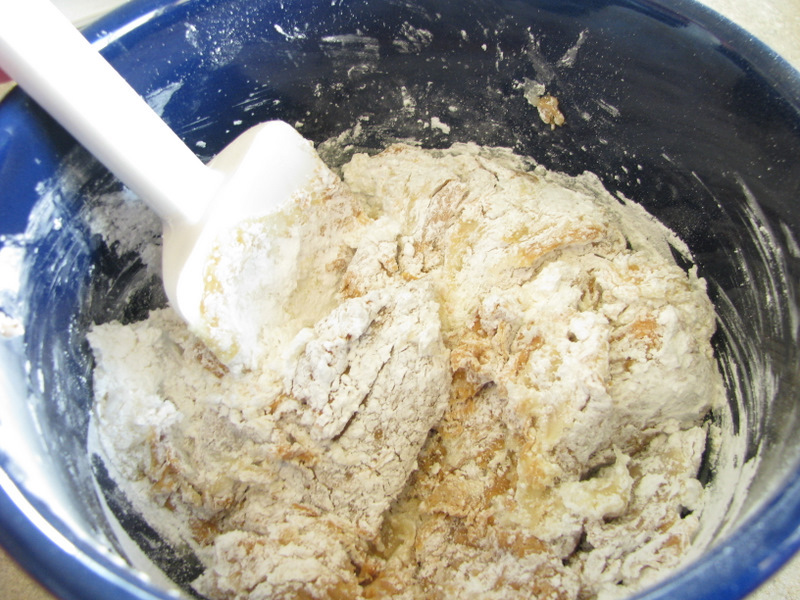 It is thicker than a batter, but a pretty runny dough. About the surface you’ll be baking on– You can bake on a plain (very-well-greased) sheet pan. 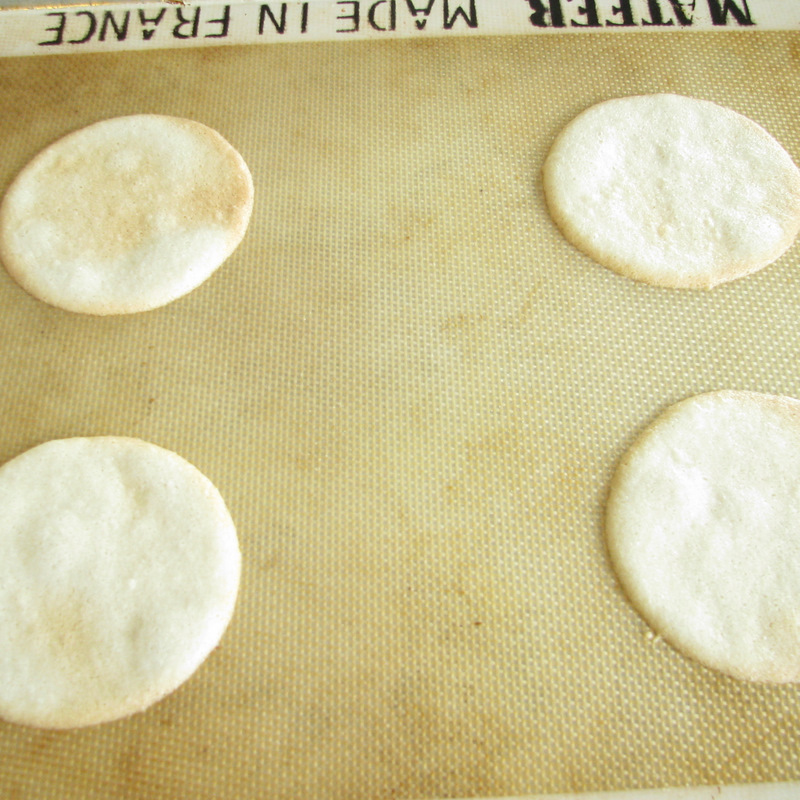 But it is tons easier and more fool-proof if you bake on either silicone liners or parchment. 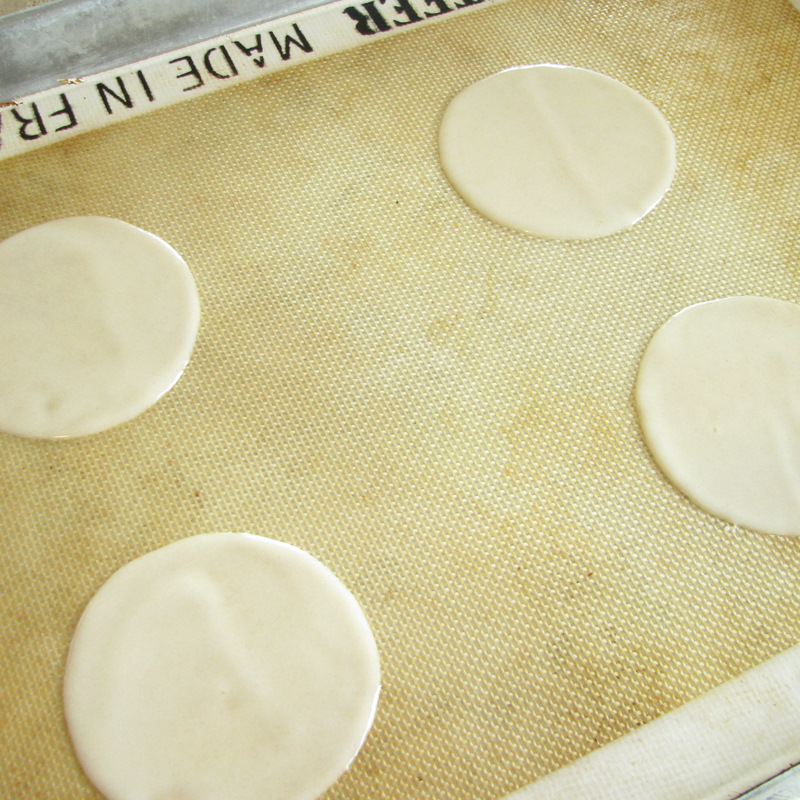 Even if you use silicone or parchment, you’ll need to grease it or spray it with Pam, so if you’re using a plain cookie sheet, you’re really going to have to grease the heck out of it to get them to not stick. So if you have silicone or parchment, use it! Oh– and if you’re using parchment, you really could just trace some 3″ circles right onto the parchment for your guide instead of making the template. I used silicone liners for mine, and I’m sorry they look so nasty. I’ve been using these for almost a decade, so even when they’re clean they look kind of gross. Sorry. 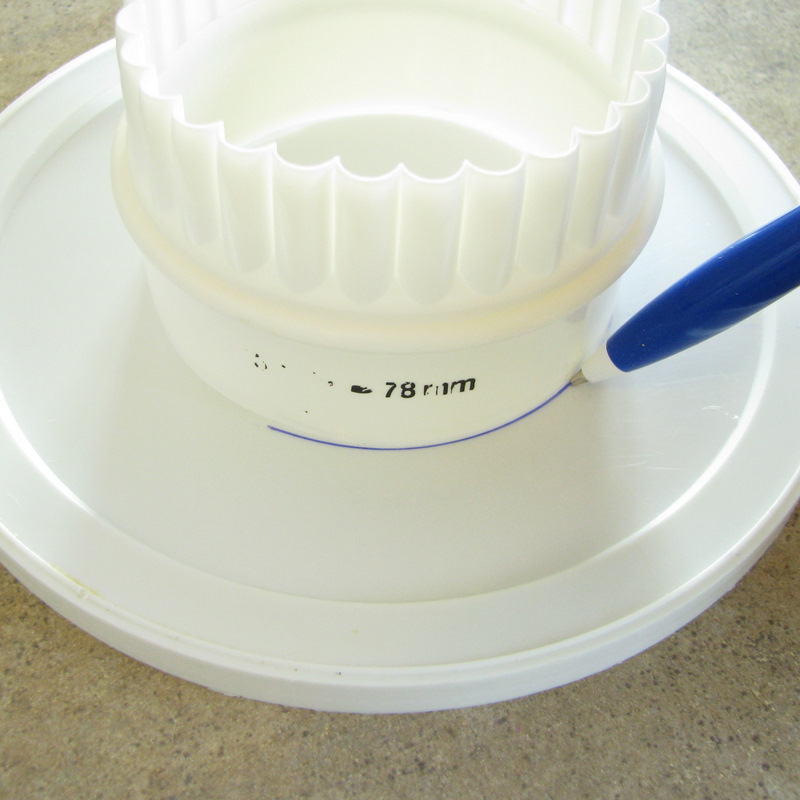 Spray silicone or parchment with Pam, or grease the heck out of your pans. 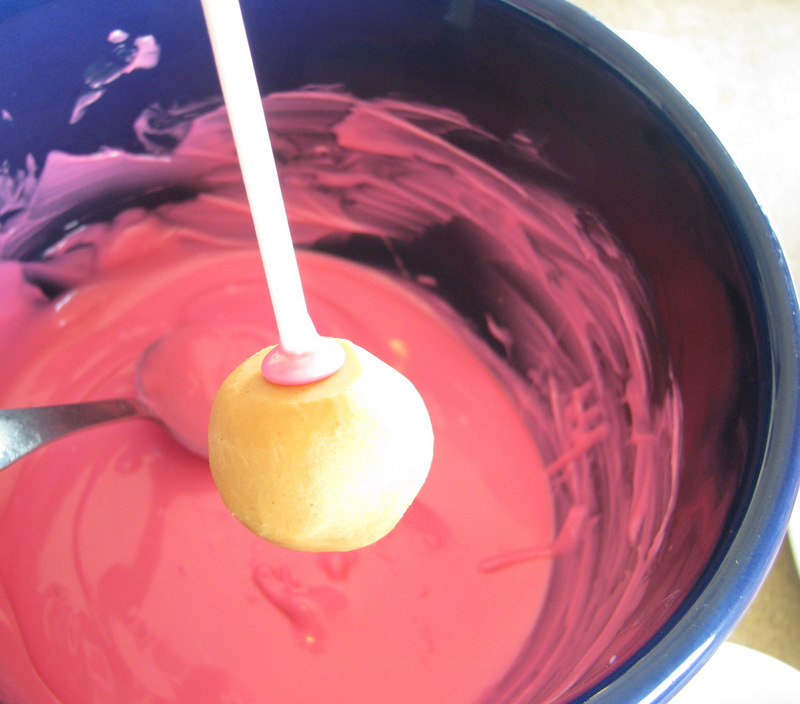 Place your template on the pan and put exactly 1 teaspoon of batter in the center. 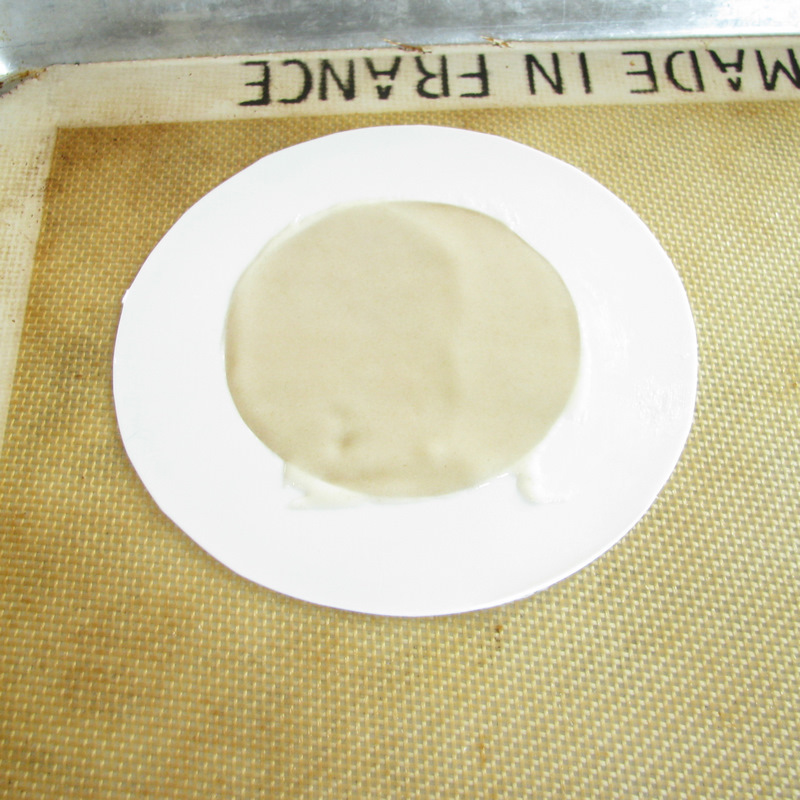 Use an offset spatula to spread the batter around inside the template. Go all the way to the edges. If you aren’t using a template, just eye-ball a 3″ circle. The batter will be very thin. You may even be able to see right through it in spots. That’s ok. And, um, sorry about the water spots on my spatula. I have hard water, ok? 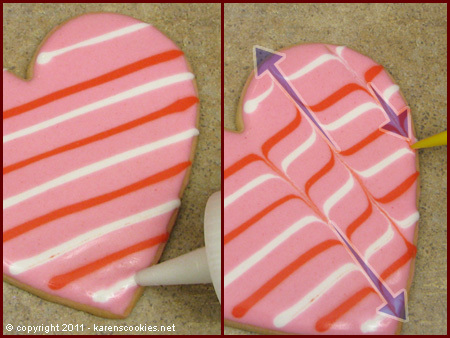 Lift off the template, and repeat up to 3 times, for a maximum of 4 cookies per sheet. Four is really the max that one person can do at a time. You have to work really fast at folding when they come out of the oven, or they’ll get too stiff to fold. If you have helping hands in your kitchen, you might be able to do 6 per sheet. I actually recommend only doing 2 for your first batch and work up to 3 or 4 as you get the hang of it. Bake them in a 400 degree oven for 5 minutes, or until they start to get brown around the edges. Determining when they are ready is probably the trickiest part of the whole thing. They need to be lightly browned if they’re going to set up nice and crisp, but the browner they get, the faster you have to work with them. The paler ones are easier to fold, but they won’t crisp up as well. So you have to learn in your first couple of batches what the happy medium is. Ok, so as soon as you pull them out of the oven, start folding. I think it’s easier to just peel them off the pan with my hands, rather than trying to use a spatula. A spatula can tend to mush them up, but if your hands are really heat-sensitive, a spatula might be your only choice. If you do go that route, I would grease it first. So either peel one off, or use a spatula, and flip it onto a wooden cutting board or counter so that it’s upside-down. 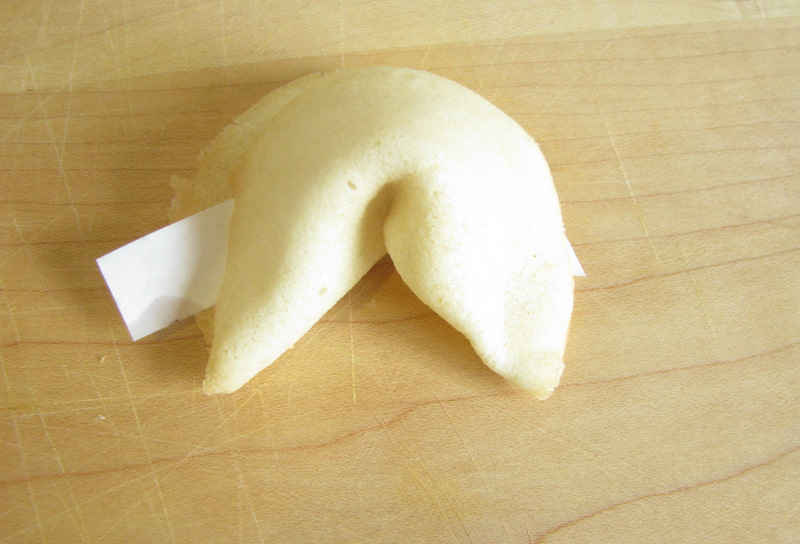 Quickly lay one of your fortunes across the center. Then, fold it in half like a taco. Next, you’ll take the outside “corners” of your taco and pull them down towards each other. If they cool too much while you’re working with them and they won’t fold, you can put them back in the oven for 20-30 seconds to heat them back up again. As soon as you’re done folding one, plop it into a muffin tin. The round muffin cavities will help them keep their shape while they cool. You can be done right there. 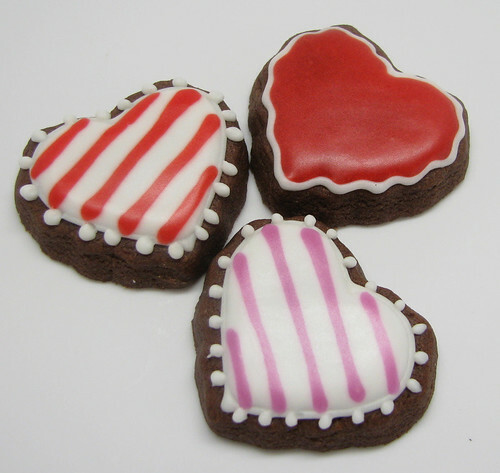 Or… if you’re feeling extra festive and fancy, you can dip them in chocolate and sprinkle them with some Valentine sprinkles. 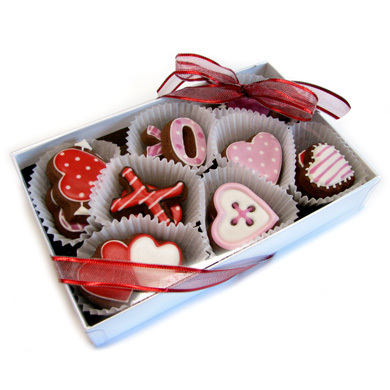 Place them on wax paper or parchment while the chocolate sets up. Look how fancy these are! And you can make them as personal as you want, since you’re writing your own fortunes. I think that would be a fun ending to a special Valentine’s dinner. And did I mention that they taste REALLY good? 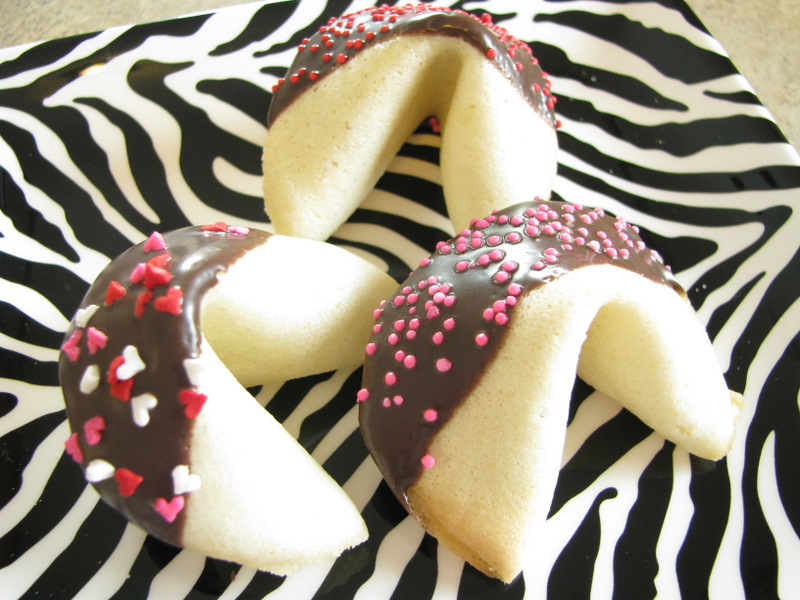 They are so much tastier than store-bought fortune cookies. Yum! These were kind of tricky to get out of the cutters. I had to make sure the dough was super cold and I dipped the cutter in flour, and both of those things helped a lot. 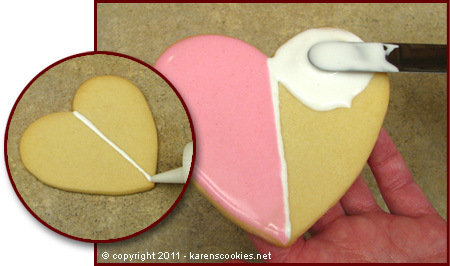 Just a little tip for you if you have cutters that have small-ish parts that don’t want to come out of the cookie cutter. Cute, huh? I love the look of this! Each paper cup has 2-3 cookies in it. They could have all had 3, but I just didn’t have enough cookies to fill it (a few disappeared somehow…), so this little 7″x4″ box will hold about 2 dozen mini cookies! I think it looks like a fancy gift, but it’s really quite simple. Oh, and happy Groundhog Day! 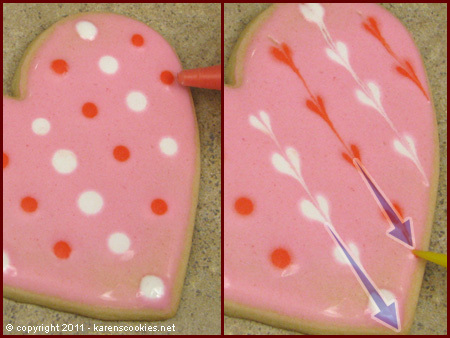 I had fun playing around with some Valentine’s Day cookies. This was an experimental batch of chocolate cookie dough. All I did was substitute 1/2 cup of cocoa for 1/2 cup of the flour in my regular Rolled Sugar Cookie Dough, which is what Pam does with her recipe. I thought it turned out great. The only thing I’m not sure about is whether they are as sturdy. I had a few of them break on me while I was decorating, which is pretty unusual. I guess it makes sense that they would loose a little bit of stability by substituting cocoa powder for the flour, because you’re loosing a little bit of the gluten, which is kind of like the glue (glue-ten!) that holds things together, but I didn’t think it would make that much of a difference. They weren’t super brittle or anything, and maybe I was just extra butter-fingery (what?? My spell-checker says that’s not a word!) the day I did these. I wouldn’t put it past me. 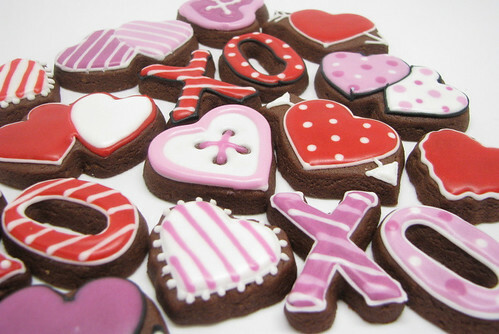 But anyway, I think it was a fun change, and I LOVED the contrast of the red, pink and white against the dark cookies. 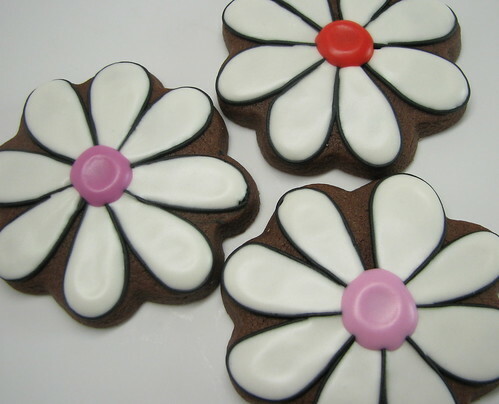 These daisies are super-simple. I just outlined in black, filled in white and added a colored “button” for the center. The buttons caved in a little bit, which sometimes happens when you’re using thinned-down MPB. I didn’t mind it at all on these, though. I think it adds to the look. Also, you’ll notice that my petals are uneven in both size and spacing, but I think it adds to the charm! Don’t worry about getting them too perfect. Some cute little hearts using marbling and feathering techniques. 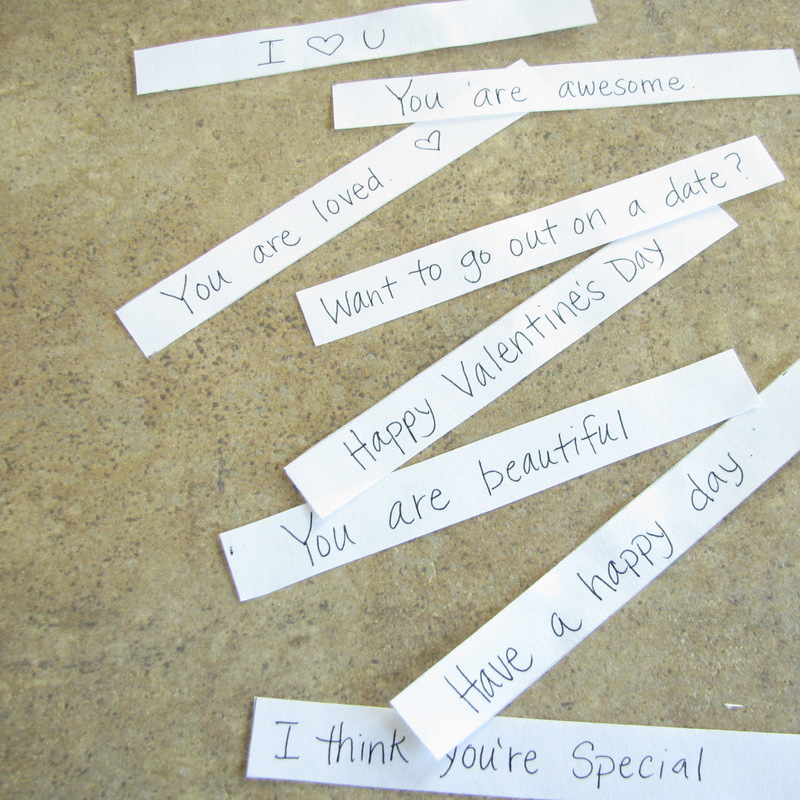 If you didn’t catch our Valentine Hearts post, go check that out for more instruction. More hearts in a more stylized shape. Hugs and Kisses! I had a red one too, but it broke so I had to eat it. I really love this cutter. I told you earlier that I have a square cookie obsession, so when I was baking up this batch of cookies, I did some squares without really knowing what I was going to do with them. 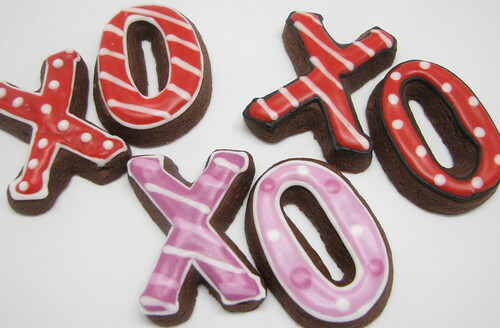 I thought maybe I’d spell out L-O-V-E, like I did with the S-N-O-W in my winter post. 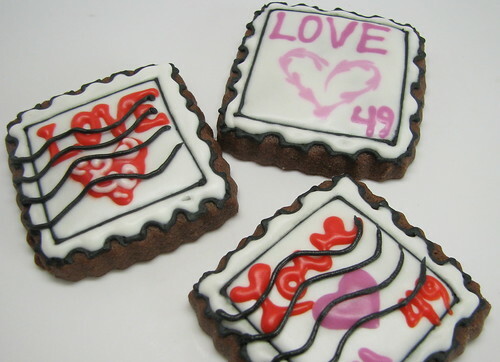 When I got to decorating, I realized that the small crinkle squares looked kind of like stamps, and Valentine’s Day is all about love letters, so I tried some stamps. The two with the “cancellation” lines on them were done with just a writing tip and black MPB, but I’ll show you in tomorrow’s post what I did later that I liked much better. Fun mix! I’m still kind of a sugar cookie purist, but this opened my eyes to the possibilities of chocolate! I can’t believe it’s already January EIGHTH! How did that happen? 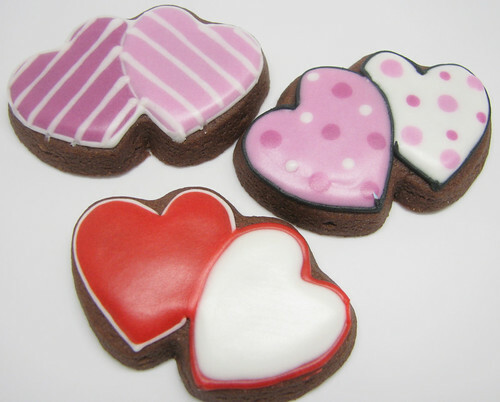 Valentine’s day is coming right up, so for my first “real” post, I have some fun cookies for you to try. 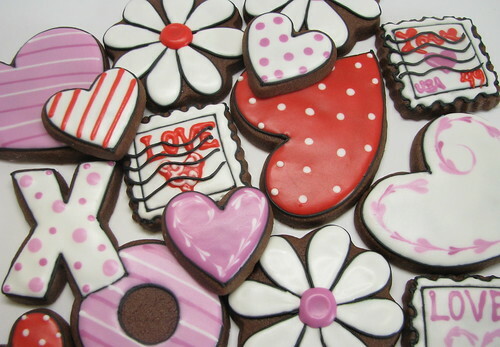 These are actually some of the very first cookies I ever tried when I was learning cookie decorating. 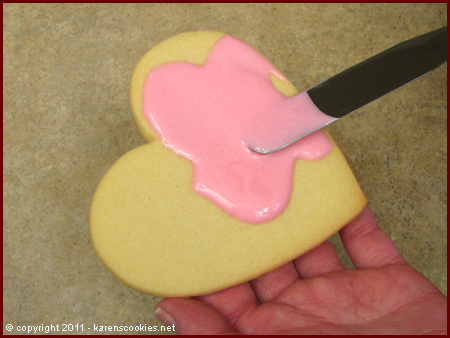 I received a little tin of heart-shaped cookies as a gift, and inside was a recipe for powdered sugar glaze (similar to this one) and some simple instructions for drizzling and swirling the icing. I had so much fun doing them, and I’ve loved this method ever since. 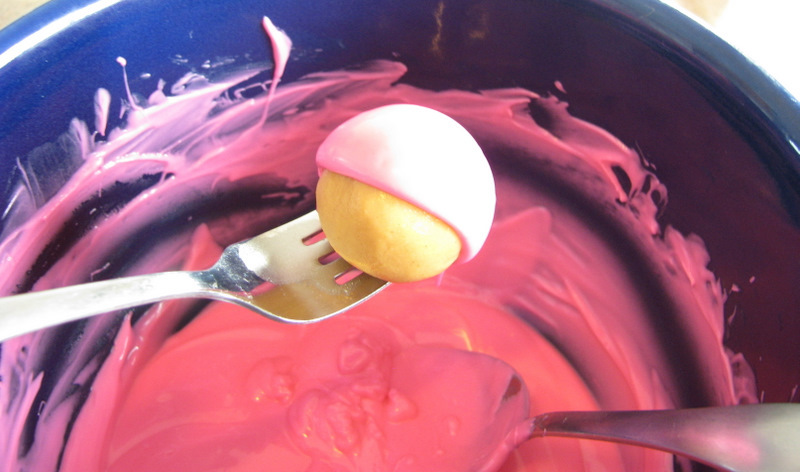 Give it a try, and if you have kids, they would LOVE to play around with these! 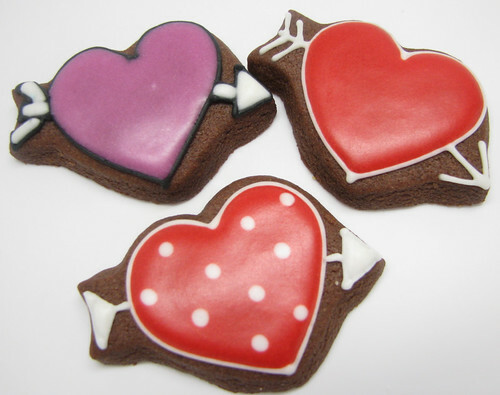 Bake a batch of cookies using one of our recipes or your own. 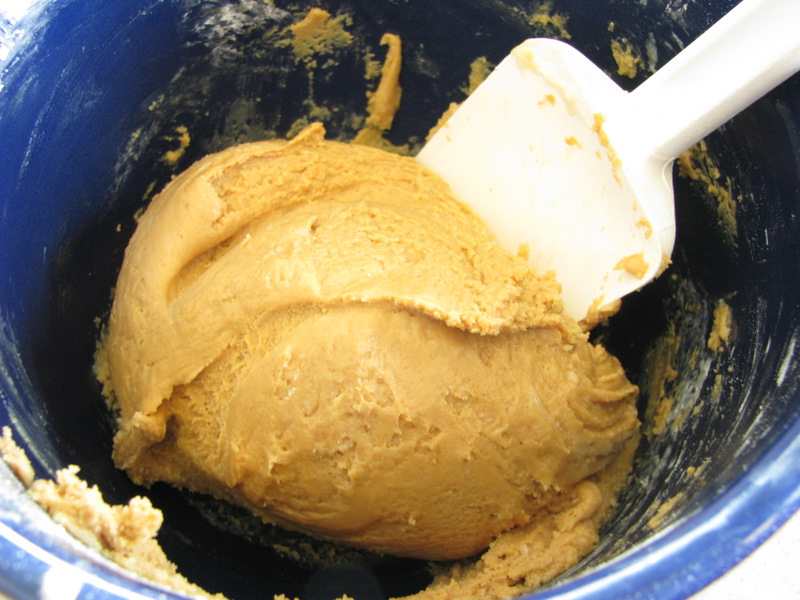 Make a batch of frosting using one of our frosting recipes. One batch of frosting will cover approximately 3 dozen medium cookies. Turn the finished frosting into glaze by adding 5 Tablespoons of water per batch of meringue powder buttercream, or 3 Tablespoons of water per batch of royal icing. Stir until smooth. Divide glaze evenly into 3 bowls. Color one red, one pink, and one white. Pour half of each color into squeeze bottles. Cover bowls with plastic wrap and cap bottles when not in use to prevent drying. 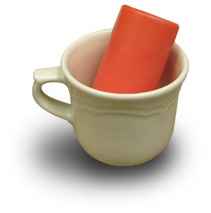 NOTE: We use a cookie scraper in our photos. If you don’t have one, a toothpick will do. With each design, start with a base coat of glaze. 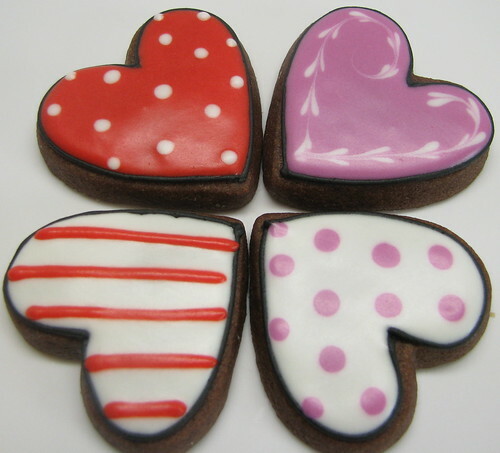 Choose a color and apply an even layer over the cookie. 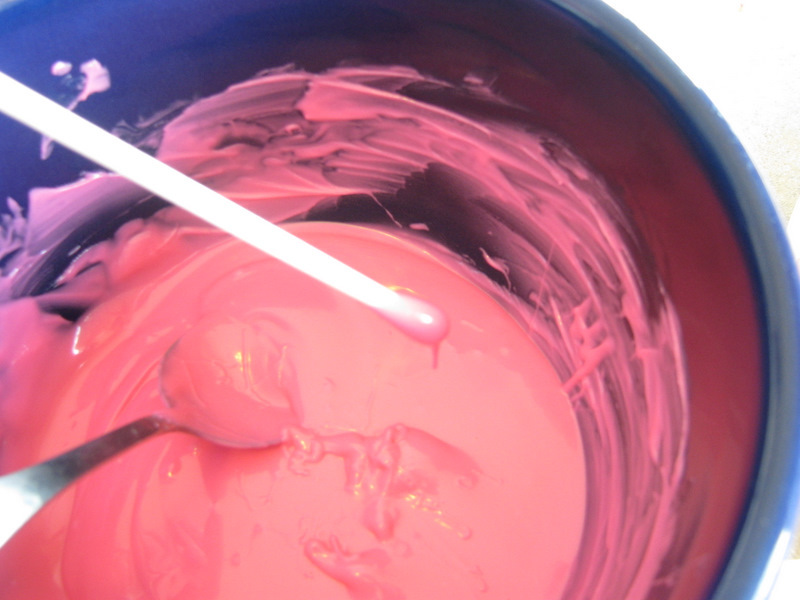 Keep this layer thin to prevent oozing when other colors are added. To create multiple background colors, first pipe a dam using a squeeze bottle. Allow this to dry briefly, then glaze each section as described previously. You’re ready to decorate! Before your base dries, finish your design using the following instructions – depending on the desired design. Helpful Hint: Clean off the tip of your scraper or toothpick between swipes to avoid unwanted color blending! 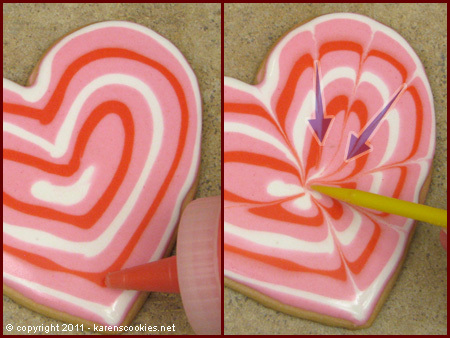 Draw a series of lines across the glazed cookie with a squeeze bottle. Then drag your scraper or toothpick alternately up and down through lines. 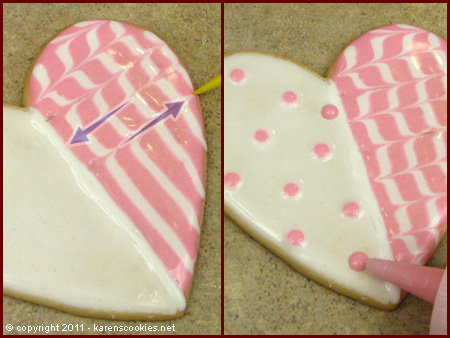 Draw concentric hearts, then drag lines from the outside to the center. For a different look you can drag from the center outward. 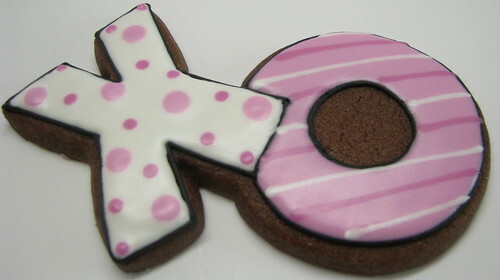 Try two designs on one cookie! Make flat dots by placing your dots while the base is wet, or raised dots by doing so after the base has dried. 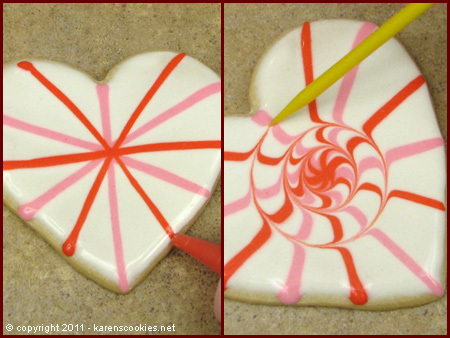 Create a tie-dye look by first drawing lines across the cookie, then dragging the scraper in an outward swirl, starting from the center. 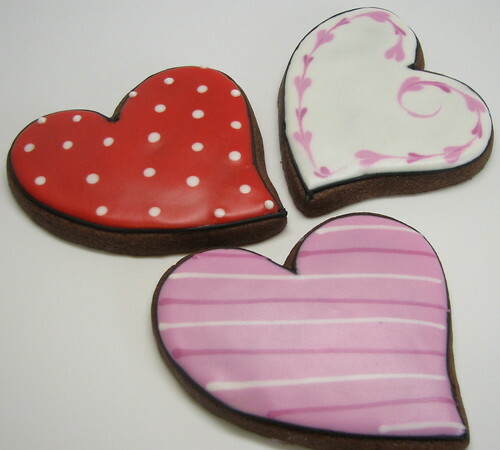 Hearts are fun and easy! 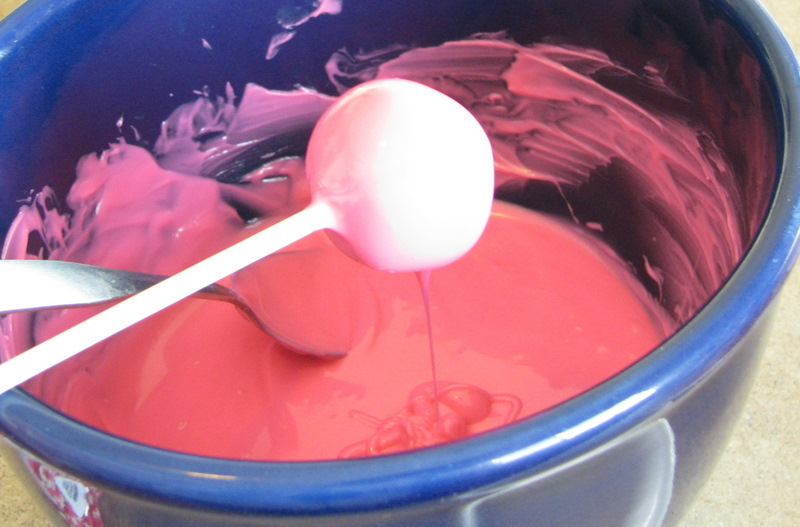 Place dots onto your wet glaze using a squeeze bottle, then drag through the entire column in one motion. Get creative with your hearts! Here we placed the dots around the outside before dragging through them. We ended with a stylish tail on the last heart. 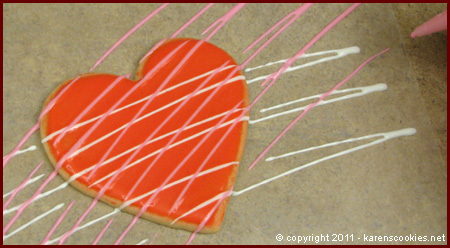 For a fun free-form design, place a cookie on wax paper, then drizzle quick lines back and forth. These lines will lay flat against your background if done when wet, or will be raised if done after base dries. 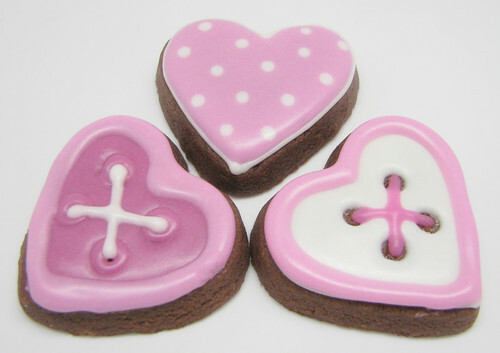 This technique can be used to decorate several cookies at once. 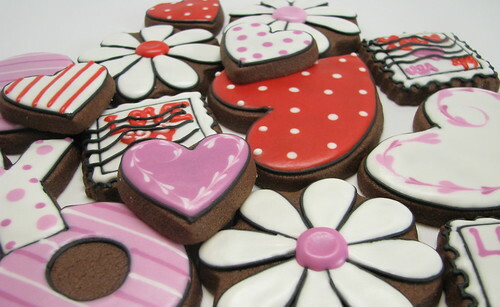 Place cookies close together to prevent waste, and have fun! To make flowers, arrange groups of 4 dots. 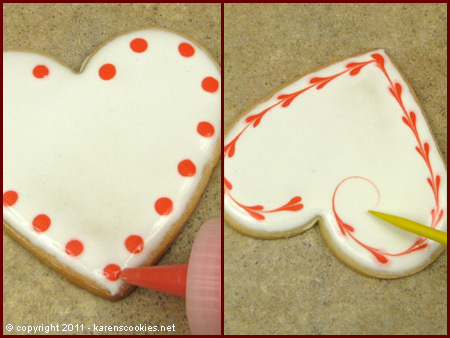 Make heart petals by dragging through each dot toward the center of the grouping. Finish each flower by placing a dot where the tails meet. Draw a series of arching lines across heart. 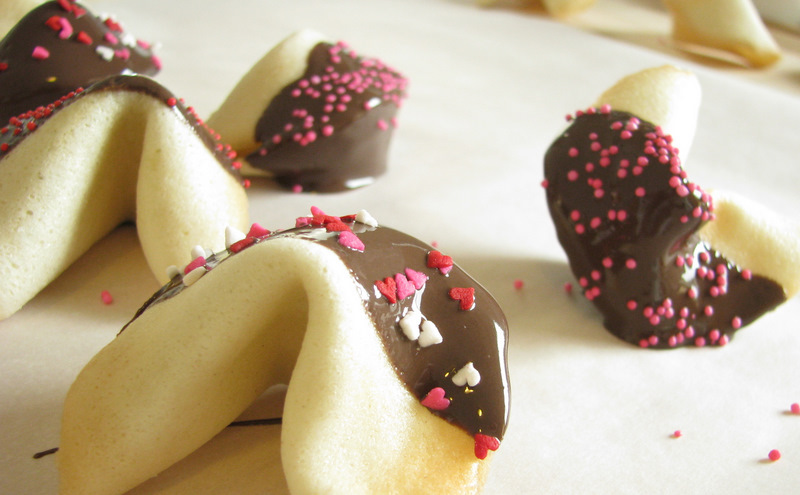 Drag your scraper downward through the lines, curving your paths toward the outside edges of the cookie. Finish off with a dot in each section. Tip: Keep your capped squeeze bottles upside-down in cups. 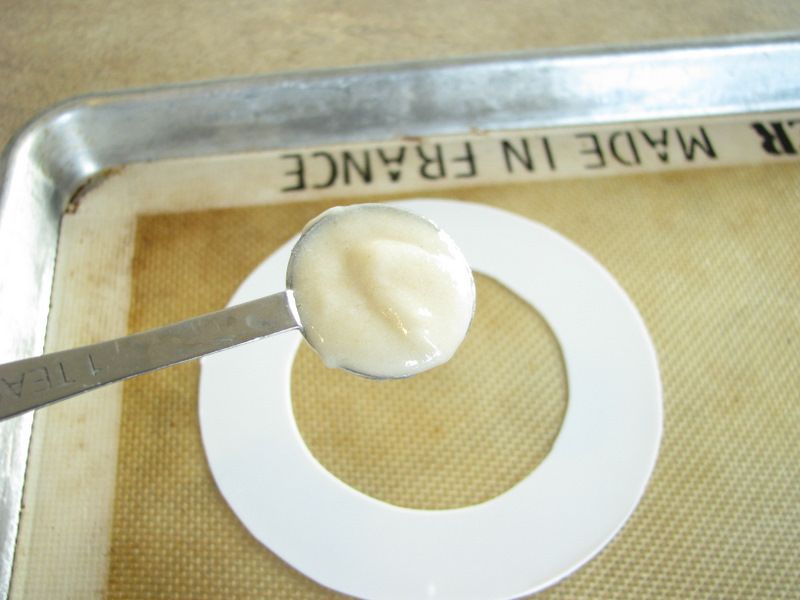 This will keep the glaze down toward the tip and ready to use! Hopefully this helps you start thinking of all the countless ways you can apply these techniques to your own new creations.